Your glasses will have the perfect safe haven when not in use with our Soft Eyeglass Case! No more misplacing them, holding them in your pocket, or risking having them smashed - they'll always have a place to call home. 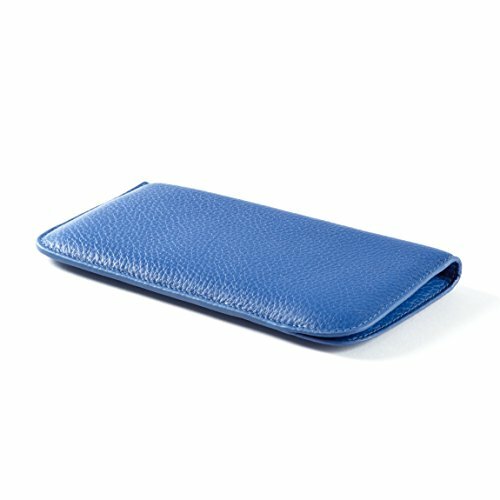 Made from quality leather, our Soft Eyeglass Case has a velour interior, giving your glasses a soft place to rest that won't scratch the lenses. Whether you're looking for something to hold them in your pocket, in your handbag, or just on a desk or nightstand, our Soft Eyeglass Case will keep them protected at all times. Our Classico leather collection is a semi-aniline, drum dyed pebbled leather. It offers a little extra color and character, making it a good choice when you want your accessories to stand out. This full grain leather has a soft hand feel with intricate lines, giving it a distinct look from our smoother leathers like Vero and Zita. It comes in a wide variety of colors that you won't find in our other collections and has a polished finish to make them really shine. Its unique appearance and range of colors make it ideal for matching with purses, belts, or other leather items you own. View More In Eyeglass Cases. If you have any questions about this product by Leatherology, contact us by completing and submitting the form below. If you are looking for a specif part number, please include it with your message.